People in India are fueling their passion for food through their open food business ventures. Along with it, is the startup wave that has hit the country and encouraged a lot of people, especially women to open their own restaurant venture. Established as a retail or wholesale venture, baked goods are sold to consumers in a Bakery Shop. This is done through a storefront location. The business for selling baked products has been there for thousands of years. However, it has also evolved over the years due to the fame and desire that the art of baking has received. While grocery stores and supermarkets are keen on selling pre-sliced breads, cakes, and pastries, many still prefer to get their kind of flour baked from a small artisanal bakery. This may be because of taste or age-old household tradition. The recent move of commercialization of baked goods has increased the quality characteristic in the trade of baking. Therefore, the passion of baking is now catching up into the small and big bakery business. The profit potential for a bakery is good, but starting a food business is never easy. A lot of things have to be taken care of. 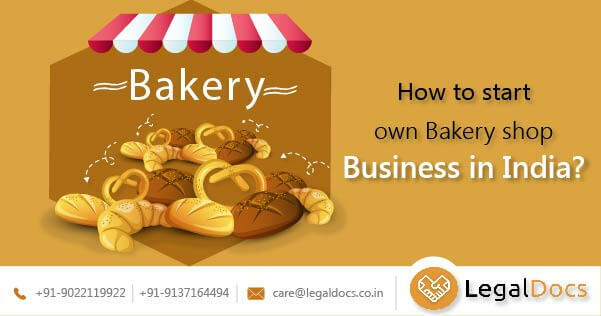 Bakery Business Plan: The first and foremost step to begin a successful Bakery Business in India is to create a business plan specialized in manufacturing bakery items. This will help to streamline the operations, decide the budget allocation, and plan for future development of the business. Summary of the bakery business that one is thinking of doing. An overview of the business. Industry analysis of the trends that are going on. An operation plan for streamlining operations efficiently. Financial Analysis that will help to plan budget of the business and also the cost-benefit analysis of the business. A proper marketing plan that is built to target the customers of bakery products. Location of the bakery: An ideal location of the bakery is important especially for carrying out good retail business. Ideal location may be a reputed market or high-end shopping streets. The purpose of deciding the location area is to know the footfall that the bakery will have. Easily accessible and visible front area shops at the ground floor are considered apt for the bakery business. If the budget permits, one may choose to have a two-floor shop such that there is a kitchen on the first floor and the showroom is on the ground floor. Further, a proper water supply and drainage facility will help in efficient operations of the bakery. A legal agreement regarding rent or purchase of property is important in order to avail license for a bakery. In case of a rental agreement, a No Objection Certificate (NOC) from the property owner must be availed declaring that he has no objection that the shop would be used for bakery purposes. These days, house-makers have also chosen to operate bakeries from home. They make baked items at home and sell them to wholesalers, retailers, or to customers. FSSAI License: It is advisable to take professional help to avail FSSAI license. A complete paperwork and FSSAI license fee is required to avail of this license. Since it is a bit complex process, it is advised to get a five-year food license to avoid renewal every year. GST Registration: The professional help of a Chartered Accountant is advised. Post GST Bill, all other indirect taxes are removed in business. It is important to understand the application and implication of GST imposed on the bill by the bakery owner. Health License: A local Municipal Health Inspector provides a Municipal Corporation Health License by charging some fee. Fire License: After the installation of fire extinguisher cylinders, a fee is charged by the local fire department depending upon the scale of operation of the bakery. Trademark and Copyrights: Trademark of a logo, symbol or name of the shop is important for the purpose of branding and marketing of the bakery items. Trademark registration forbids other people from using the same logo or symbol. Thus, creating a unique identity of the bakery. One may also choose copyright recipes. This will help to protect the taste and influence of special products on the customers even if the chef is changed. The process of application for registration of trademarks is governed by the Controller General of Patents, Designs & Trade Marks. It is only after the application is given one can use TM, and once registered, one can use symbol R. However, application of copyright registration is governed by the Copyright Office. Manpower: Bakery shops require expert and trained manpower who can make items that look good and taste better. Generally, high-end bakeries prefer to hire head Chef, Chef de parties, and Commi level chef. Besides, helpers, service boys, and cashiers are also required here. Kitchen equipment: The equipment must be tough and long-lasting. It is generally made up of stainless steel. Majorly, equipment required in a bakery are; planetary mixers, ovens, deep fridges, cooling fridge, gas stove, cylinders, storage utensils, and molds. The bakery kitchen equipment is expensive. One must acquire new equipment for better efficiency. Display area: The front end of the bakery must be dedicated to developing a display area that must be well designed and created in a manner such that it is noticeable and attracts walk-in customers. This is important to create footfall. This can be done through display fridges for cakes and pastries, and a display rack for items. Billing software: The billing software specialized for bakeries these days include inventory management. There are features to manage the shelf life of the baked items. Inventory for perishables is also checked here. Therefore, the correct choice for the software must be made wisely. Marketing and Branding: A properly designed logo and display board are some of the common marketing and branding techniques followed by bakeries. Also, a properly designed menu and pamphlets attract customers. Staff uniform: Essential to deliver the professional look, it also adds to brand value of the bakery. It is vital that the staff looks clean and hygienic. This includes chef coats, smart shorts or t-shorts for service staff, an apron, a head cap, and gloves. Besides these basic requirements, one must also think of getting a landline and mobile numbers dedicated to the bakery. As online ordering has become the need of the hour, it is also important to have online tie-ups. Creating a website may be a difficult choice for some, but online social networking sites may play an important role to connect with the customers. This helps to get the feedback and reviews for further improvement. Are you confident and Motivated enough to Start Bakery Shop Business in India?